Develop your dance skills and springboard yourself onto the social dance floor with Yuli B from Los Angeles! Yuli's targeted classes & workshops are focused on the unique needs of tango dancers. She enjoys helping dancers achieve their fullest potential. Florida's own Alper Ungor will be teaching with Yuli! It will be a spectacular learning opportunity! Join us in either Gainesville, Tampa, or both locations! Private classes also available! Contact Alper Ungor to arrange. Join us for a fun and funky Milonga Bohemia on Saturday March 16th with DJ Alper Ungor! Plus a special class at 7pm with guest instructors Yari Helfeld and Alper Ungor! This all-levels technique class will be taught by visiting guest instructor Yuliana Basmajyan from Los Angeles! No partner or pre-registration required. This all-levels course will focus on foundations of social tango including embrace, connection, and walking. We will learn several common social figures, including variations and musicality. This program is open to those brand new to Tango and also to the experienced Tango dancer who want to improve and polish their dance. Each class is approximately 75 minutes with a 45 minute guided practice session immediately after. No pre-registration required, just show up! What should I expect at the classes and practice? -Social Argentine Tango. Although we don’t focus on any one specific style of Argentine tango, we work mostly with Milonguero and Salon styles. We typically dance in close embrace, but ultimately the embrace is negotiated by what each dancer is comfortable with. If you are wanting to dance international ballroom, North American, Fantasia, or other styles, this is probably not the school for you. -Awesome traditional tango music from the 1920s-1950s. We do not play Nuevo music at all. We may use alternative non-tango music during classes warm-ups or for specific exercises. -Our classes will be fun and safe. We teach and enforce general tango etiquette. We reserve the right to eject students from the classes and practices if they are causing harm to anyone. This is for the safety and enjoyment of everyone. We also encourage everyone to speak up for their own comfort and safety. -Everyone is welcome to dance any role they like. We welcome and encourage men as followers, women as leaders, non-binary dancers, and any combination in between. Tango is for everyone. This all-levels course will focus on foundations of social tango including embrace, connection, and walking. We will learn several common social figures, including variations and musicality. This program is open to those brand new to Tango and also to the experienced Tango dancer who wants to improve and polish their dance. Each class is 1 hour, followed by a Practilonga (practice social). No pre-registration required, just show up! What should I expect at the classes and practilonga? -A practilonga is a social dancing event that combines the relaxed etiquette of a practice with many of the same elements you will find at a more formal milonga. The music is played in 3-song tandas, as is found at many milongas. Dancers may chose to continue social dancing, moving counter clockwise around the floor, working on refining navigation skills. They may also choose to work on elements of the dance, in the inside of the dance floor. In this setting, it is ok to have dialog with your partner. For those that just want to dance, line of dance will be expected to continue moving around the outermost edge of the floor. Special tango workshop with Yari Helfeld and Alper Ungor! Food: Snacks will be provided by the Argentine Tango Club. The rest of the event will move to Tampa for Saturday night and Sunday. Topic: Exploring the Timing and Configuration of Crosses for Musicality Magic. Cost: $25 for adults including the milonga! Join us for a fun and funky Milonga Bohemia on Saturday January 19th in Tampa! Guest DJ Luigi Seta from Miami! This all-levels course will focus on foundations of social tango including embrace, connection, and walking. We will learn several common social figures, including variations and musicality. This program is open to those brand new to Tango and also to the experienced Tango dancer who wants to improve and polish their dance. Each class is 1 hour, followed by the Monday Milonga (a tango social). You may practice or just dance during the social. Use the time however best fits your needs. Instructors are available for feedback during this time. No pre-registration required, just show up! Class $15 ($10 for college students) and includes the Milonga social. What should I expect at the classes? -Social Argentine Tango. If you are wanting to dance international ballroom, North American, Fantasia, or other styles, this is probably not the school for you. Although we don’t focus on any one specific style of Argentine tango, we work mostly with Milonguero and Salon styles. We typically dance in close embrace, but ultimately the embrace is negotiated by what each dancer is comfortable with. -Awesome traditional tango music from the 1920s-1950s. We do not play Nuevo or Alternative music in classes, practicas, or milongas. -Everyone is welcome to dance any role they like. We welcome and encourage men as followers, women as leaders, non-binary dancers, and any combination in between. Tango is for everyone. It is 2019 after all! This all-levels course will focus on foundations of social tango including embrace, connection, and walking. We will learn several common social figures, including variations and musicality. This program is open to those brand new to Tango and also to the experienced Tango dancer who wants to improve and polish their dance. Each class is 1 hour, followed by the Monday Milonga (a tango social). No pre-registration required, just show up! Join us at Florida's new and funky Milonga Bohemia: A house of worship to Social Tango dancing, Golden Age classics, Argentine culture, and Southern hospitality. We’ll be on the lookout for your cabeceo. $15 entrance, $10 for college students and currently registered TTE students. Healthy & sinful snacks, local Naveira coffee, and other special surprises. You are welcome to bring your own wine. Please bring a water bottle and/or coffee mug/wine glass to help us reduce waste going to landfill. Line of dance and safety strictly enforced, cabéceo encouraged. TANGOFLEX® is the perfect flexibility training designed for EVERYONE including athletes, weightlifters, dancers, yoga, pilates & pole fitness practitioners. TANGOFLEX® focuses primarily on deep muscle flexibility that empowers self-reliance. It is the perfect complement to your daily routine. Fun for all levels, no experience required! The TANGOFLEX Method is inspired in tango, where posture, dissociations, isolations, and core control are essential in the dance. However, there is no dancing in the routines, just interesting new concepts that will make you look at your body in a different way, finding ‘intention’ to be one of your priorities to accomplish your goals. This is the perfect class to stretch your tired muscles and keep you dancing in classes and milongas during the festathon! BRING A TOWEL OR YOGA MAT! This class is included in the Full Pass or is $10 pre-purchase online OR $15 at the door. Open to anyone, regardless of dance experience. Part Marathon. Part Party. All Fun! November 22nd-25th. This all-weekend marathon is limited to 160 dancers and role balanced. Registration closes when we reach capacity. Passes will not be available at the door. Join us this Thanksgiving Evening for a warm Milonga with our tango family. Thanksgiving Dinner Is Included w/ vegetarian options. Registration is closed. Admission is NOT available at the door. We are excited to have Michelle Lamb, all the way from New York City, for a special tango drop-in workshop in Tampa! She's awesome. We love her and know you will too! What a party our Grand Opening was! When we double-checked our count, we had 100 tangueros! Can we make it 110 in October?! I think so! Plan to come and invite your friends. We are working on more seating this time around. RSVP and let us know you're up for another fun night of dancing with us! Healthy & sinful snacks, local Naveira coffee, and other special surprises. Bring your own wine. Please bring a mug and/or water bottle. Join us for a special topics tango drop-in class with Yari Helfeld in Tampa on Thursday October 11th. The 3rd Saturday Practica that began as an experiment 16 months ago in our home studio is transitioning into a new chapter. Because of your support, this event turned into a regular gathering of tango family and was better than we ever could have imagined. Now it's time to grow into something even better. To that end, we proudly present the grand opening of Milonga Bohemia. A house of worship to social tango dancing, Golden Age classics, Argentine culture, and Southern hospitality. Healthy & sinful snacks, local Naveira coffee, and other special surprises. Bring your own wine! This month we will have the final "3rd Saturday Practica" on the 2nd Saturday, August 11. Why the final? We are transitioning to the new Milonga Bohemia every 3rd Saturday at our studio on Hillsborough starting September 15th! The fun starts at 7:30pm. All levels welcome. Proper line of dance and floor craft are mandatory. Cabeceo invitations are highly encouraged. No cost. Food and/or wine are appreciated but not required. We will have snacks too. Join us every Thursday from 8:30-10pm for an open community, all-levels tango practice! This 8-week course will focus on foundations of social tango including embrace, connection, and walking. We will learn several classic figures, including variations and musicality. Each class is 1 hour. You must complete both Level 1a and 1b, in any order, before moving to Level 2. This course starts Thursday, August 2nd at 8pm, at 3932 W Hillsborough Ave, Tampa, FL 33614. You must secure a spot by registering in advance. The course is $120 for 8 weekly classes of 1 hour, and the 9pm-10pm practica is included. The course is refundable up until 5 days before the start of the course. This 8-week course will focus on social movements for the milonga (a tango social). Each class is 1 hour. We will learn several classic figures, including variations and musicality. You must complete both Level 1A and 1B, in any order, before moving to Level 2. This course starts Thursday, August 2nd at 8pm, at 3932 W Hillsborough Ave, Tampa, FL 33614. You must secure a spot by registering in advance. The course is $120 for 8 weekly classes of 1 hour, and the 9pm-10pm practica is included. You must join by the 2nd week. The course is refundable up until 5 days before the start of the course. Join us for our cozy monthly practilonga! The lovely Mehtap Akbaş will teach a class on "Common Fundamental Mistakes" before the practica. Tango Tune-Up is a fun and challenging workout for tango dancers! 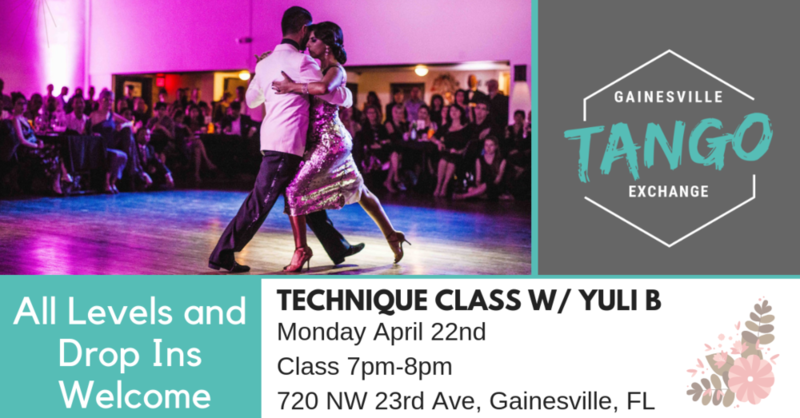 This intensive 2 hour session is dedicated to drills and exercises that will strengthen and "tune-up" your body specifically for the kinds of movements required in tango. Most of the class is individual work focused on technique and body mechanics.